Hugh of Singleton, fourth son of a minor knight, has been educated as a clerk, usually a prelude to taking holy orders. However, he feels no real calling - despite his lively faith - and he turns to the profession of surgeon, training in Paris and then hanging his sign in Oxford. Soon after, a local lord asks Hugh de Singleton to track the killer of a young woman whose bones have been found in the castle cesspool. Through his medical knowledge, Singleton identifies her as the impetuous missing daughter of a local blacksmith. The young man she loved - whom she had provoked very publicly - is quickly arrested and sentenced at Oxford. But this is just the beginning of the tale. The story of Singleton's adventure unfolds with realistic medical procedures, droll medieval wit, romantic distractions, and a consistent underlying sense of Christian compassion. 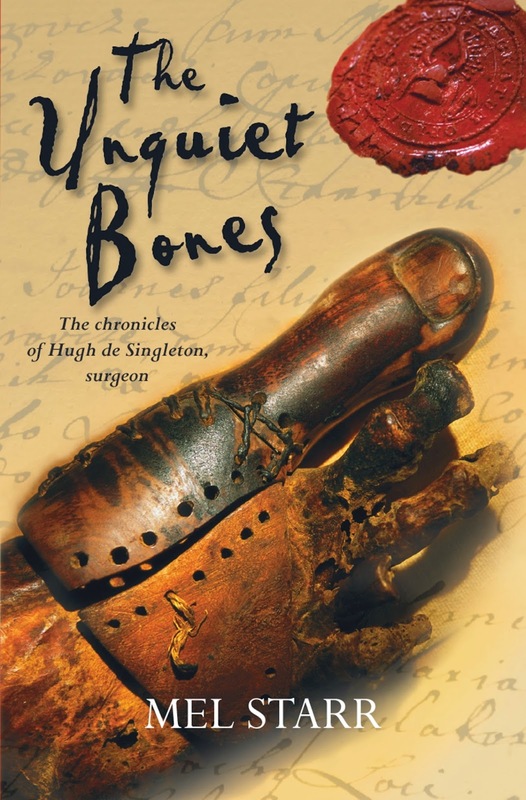 The Unquiet Bones is the first in a series of five books so far featuring Hugh de Singleton, Surgeon. After achieving his bachelor's degree, deciding not to take holy orders, surviving the plague and studying abroad in Paris, in 1363 we find Hugh de Singleton setting up his own surgeon's office in Oxford. After impressing the Lord of Bampton Castle, Hugh is offered a permanent position as the only surgeon in town and is soon asked to inspect a set of human bones for cause of death. His keen observations that a murder has taken place sets the scene for a charming medieval murder mystery. Author Mel Starr does a terrific job of making the reader feel like they're really in the 1360s, and the glossary at the beginning was marvellous. Despite being a fan of the genre (particularly the work of Paul Doherty) some of these terms were new to me and added to my overall reading experience. For example, I had no idea that a fewterer was the keeper of the Lord's kennel and hounds. All in all, I enjoyed the murder mystery second to details of the medical maladies Hugh saw to in the town of Bampton and the remedies he used. Personally, I would have preferred more focus on his surgical and medical skills and less on his investigation, however that's just me.